The path to recovery is already started in the first session. There is full attention for the person and the reason for the visit. There is no strict protocol to be followed. The first session can be filled in any way that fits the patient. Not everyone wants or is able to talk about how things are or what has happened. For others it can be liberating to talk about themselves and get attention and time for this. The ways the diagnoses go is as diverse as the people who come to the practice. A lot of information is important for the diagnosis. The complaint(s), the further health, the personal history and bodily functions like metabolism and bodily temperatures are asked about whilst the person's limits and bounds are respected. The person is also asked about any possible other therapies, what their lifestyle is like and what he or she sees as their personal strong and weak points. Of course the pulse is also taken to get an impression of the quality of the meridians and the matching vital organs. After the diagnosis treatments follow that are concentrated on the person and the personal circumstances. 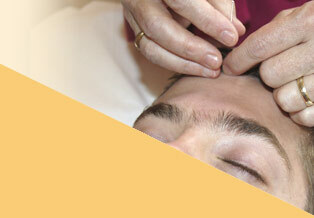 These treatments consist of repairing the energy balance by using thin sterile acupuncture needles on specific points. A bodily sensation or a sensation of a different kind can shortly be perceived at the moment the needle touches the acupuncture point. Only sterile (disposable) needles are used. The acupuncture points can also be stimulated with heat. This is called moxabustion and consists of shortly applying a smouldering ball of the herb mugwort or artemisia vulgaris. Traditional Acupuncture is a natural therapy that can be most clearly perceptible in the first couple of days after treatment. Nature heals complaints in a pattern that goes outwards, downwards and from the present back in time. The effects may be perceptible in the body, the feelings or the mind. At first the treatments will be weekly, then once every two weeks and after this they are spread even further according to the personal needs. Seasonal changes might increase the need for treatment. A small selection of vitamins and or minerals.